Samsung has applied for a patent on a phone with an expandable display. It seems pretty safe to say that this Samsung expandable phone won’t be available for purchase any time soon because the technology looks along the lines of something from The Jetsons (yes, I know I’m dating myself here…). We’ve seen multiple patents from various companies for foldable smartphones, and Samsung even showed off a foldable phone at CES this year. The concept for this Samsung expandable phone is different though because it features a display that’s in three parts. In the closed position, the device looks rather like a standard smartphone of today. However, the open position features two extra display panels which can be pulled out from the sides of the device. The display panels would have to be slightly flexible, according to the application. In order to expand the smartphone’s display, the user would have to gently bend the flexible display slide the extra panels out. It’s hard to imagine how a device like this would really work. It seems like it would be a nightmare to have to repair it, and the use of moving parts for a sensitive component like the display presents plenty of opportunities for problems. It’s also a bit unclear how the expanded display would look, as right now I’m imagining a phone with a wide display featuring lines running down on either side of the main middle piece. It seems like it would be rather difficult to make a display that expands in this way and yet is seamless in the way it looks and works. 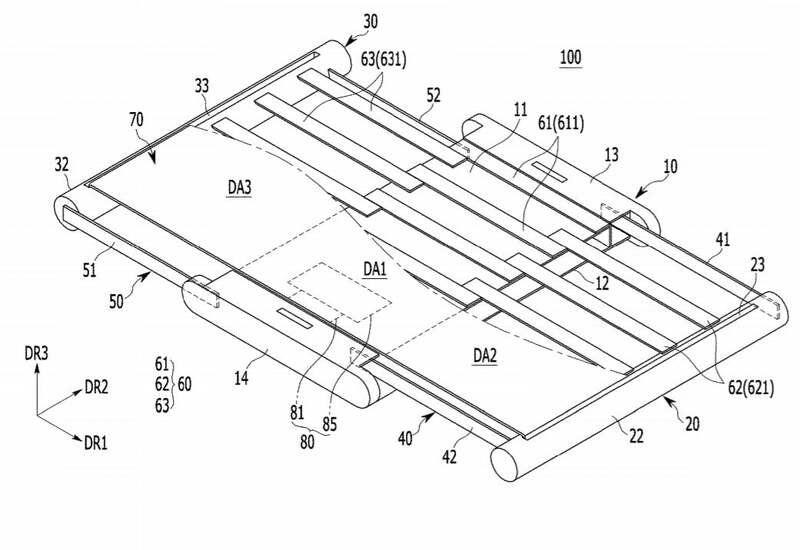 Patently Apple was the first to spot the patent application for the Samsung expandable phone. The Korean tech giant filed the application in July 2017, and then the U.S. Patent and Trademark Office published it earlier this month. At this point, it’s still just an application for a patent, so there aren’t a lot of details about how the phone would work, but what is clear from the patent is that the extra-wide display is aimed at enabling users to view widescreen videos. Obviously, having two display panels that can be pulled out from the sides would mean that the device would have to be thicker than the standard smartphone of today. This runs against the current trend of slimming down to make phones thinner and thinner. However, those who enjoy watching widescreen videos on their mobile devices might be willing to accept a thicker phone in exchange for that capability. Patently Apple suggests that a device like this Samsung expandable phone could be quite popular with growing adoption of 5G technology, which will make watching videos on mobile data connections much easier due to the speed boost the next generation of technology is expected to bring. Of course, like virtually every other tech firm on the planet, Samsung also churns out patent applications on a regular basis, and many of them never end up becoming a real, commercially-available product.